Terry Anvelink has 25 years of competitive racing experience. In those 25 years, he has earned 14 track championships. Six of those championships are from the Shawano Speedway, five are from the Seymour Tri-Oval Raceway, two are from the now-defunct All Star Late Model Racing Association, and one is from the Langlade County Speedway in Antigo. Terry lives in Navarino,WI with his loving and supporting wife Julie and their three sons, Nick, Jarrod, and Tyler. This trio is following in their father's footsteps. Nick races IMCA Modified and is having a great year. Jarrod races go-karts in Shawano,WI. Tyler is hoping to run go-karts next year. Racing has always been a family affair for the Anvelinks. Terry's first car was a 1965 Mustang that he invested $900 in and built from the ground up. The car wasn't pretty, but it gave Terry his start in racing. The rest is just history. 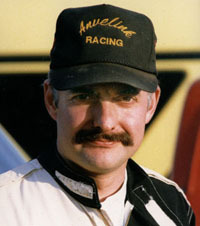 In 1994, Terry was voted "Driver of the Year" by Wisconsin Fans for Auto Racing. Terry races his #32 WISSOTA Late Model at three tracks in Northeastern Wisconsin against the fierce competition of racers like Pete Parker, the two-time defending WISSOTA National Points Champion. 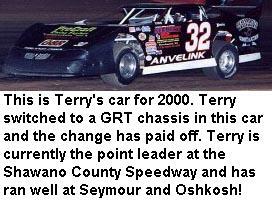 Terry finished 5th in the WISSOTA National Points in 1998. His pit crew consists of David Stedjee, Donnie Paiser, and Jarrod and Tyler Anvelink.